Review by Valerie Schuetta, M.Ed. If you are a teacher, homeschooling parent or a parent looking for an informative piece of science literature with breathtaking illustrations and photographs, this book will not disappoint. First of all, what captured my attention about this book was the vivid photographs and illustrations on the front of the book jacket. The pictures clearly define the contrast of the environments of an astronaut and an aquanaut. The book will not only engage children by showing the similarities and differences between deep outer space and the vastness of the ocean but will compare and contrast both these remarkably different worlds by giving interesting scientific facts about the two environments, including their temperatures, pressures and much more. The book begins with Forwards by an actual Astronaut, Kathryn Sullivan, and a veteran Aquanaut, Fabien Cousteau, grandson of the legendary Jacques-Yves Cousteau. In Sullivan’s marvelous descriptions, she defines how she views outer space through her own eyes. She also relates how, as a child, she was eager to be a part of the space adventure she witnessed unfolding on television and how these history-making events fueled her courage and curiosity. Her enthusiasm for her career is contagious. Fabian Cousteau’s passion for his profession is equally mesmerizing. He begins by describing the importance for exploration, and how over the years man has used the force of exploration to expand our horizons. It is obvious by his words that he is very passionate about future generations continuing to explore the universe and he can’t help but inspire children, especially children reading this book, to continue studying the mysteries of the ocean. 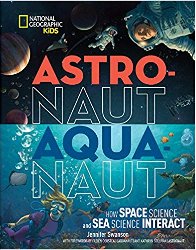 Astro-naut, Aqua-naut is a great way to inspire children to develop a love of learning and challenge themselves to reach their full potential. Each page engages them in many ways. In Chapter 1, your child can explore the differences between space and water and the similarities they both hold. For example, this chapter reveals how both outer space and the deep sea can both be very dark, but they both share the same light source, the sun. Continuing with Chapter 2, Blasting Off or Taking the Plunge, children will discover what it takes to succeed in the astronaut/aquanaut training program, once you are accepted. They will learn the importance of working together as a team and how this is so critical to success of any endeavor. The descriptions of the training programs involved are so exciting, that it is hard to believe that any child would not be inspired and excited to pursue a career in either field. Specifically, in the astronaut training program, future candidates will learn how temperature and pressure will affect them in outer space. They will also learn how microgravity actually makes you grow — up to three inches taller once in space! Young readers will discover how crucial a degree in science, technology, engineering, and math (also known as STEM) are towards fulfilling the requirements to become a NASA Astronaut. On the other hand, astronauts also must train underwater in order to learn survival skills, team work, and how to take care of each other on a space mission. This is accomplished at a facility known as the NASA Extreme Environment Mission Operations (NEEMO) team. Specifically speaking, readers learn how both astronauts and aquanauts work together in the NEEMO facility to simulate and experience the outer space and ocean environments! Future astronauts learn how to “spacewalk” in outer space by walking on the ocean floor. They learn how to move large objects while in the ocean and how to work as a team to reach goals. What an amazing way to teach young children the importance of camaraderie! There is much more astonishing information in this book to awaken a child’s creativity and arouse his/her interest in science. The sequence of this book is a great example of differentiation. In other words, if your child is not interested in outer space, they may delight at the wonders of the section titled “Strange and Amazing Animals of the Deep”. There are many marvelous sections to explore throughout this book. There are many reasons why I would recommend this book. As a teacher, parent, and lover of science, I would definitely incorporate many parts of this book across the curriculum — not just science — but many subgroups of Language Arts, including reading and writing. Children can listen to a passage titled “Typical Day in the Deep Sea”, and then write a narrative about what they might experience if they were to spend a day underwater. There are many science activities that can be implemented, including my favorite, “Design Your Own Space Suit”. This activity not only involves art, it also inspires children to use their critical thinking skills when they ask themselves, “How long will you be in space or underwater?” Many skills are coming into play with this lesson, including activating prior knowledge (what they have already read and know) and metacognition (thinking about their thinking). I also love the fact that the last chapter focuses on “What Have We Learned?” This is a great way to review and reinforce relevant facts, activate prior knowledge, but more importantly build a child’s background knowledge, so they have a better base of knowledge that enables them to learn science in the future years to come! This book is also an amazing way to increase a child’s vocabulary! V.S.